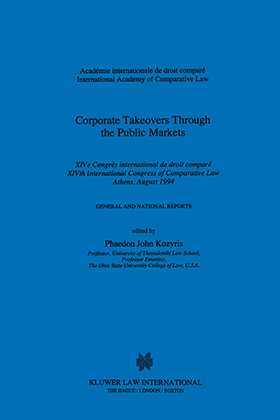 This important new volume contains the National Reports and the General Report on the topic of Corporate Takeovers through the Public Markets , as presented at the XIVth Congress of the International Academy of Comparative Law held in Athens, Greece, between 31 July and 6 August 1994. The main aim of the report is to study public market transactions, with particular emphasis on policy. It presents an up-to-date compilation and examination of the key issues relating to corporate takeovers worldwide and provides invaluable information and policy analysis for the scholar as well as for the legislator and the legal practitioner. The detailed national reports cover the following countries: Argentina, Australia, Canada, Finland, France, Germany, Greece, Israel, Italy, Japan, Sweden, United Kingdom, United States of America, Venezuela and Yugoslavia.